For the past couple of years I've been a member of The Society of Children's Book Writers and Illustrators. It's a huge group of people (mostly women I reckon) all passionate about Children's books but with varying degrees of talent. Scbwi do a competition every year called Undiscovered Voices. Anyone who writes or illustrates but is unagented or unpublished can enter. The prize is, you get published in an anthology which goes to agents and important industry people around the world. The hope is, if you get published in the anthology, some bigwig will snap you up and you'll be drinking tea and tweeting with JK in no time! 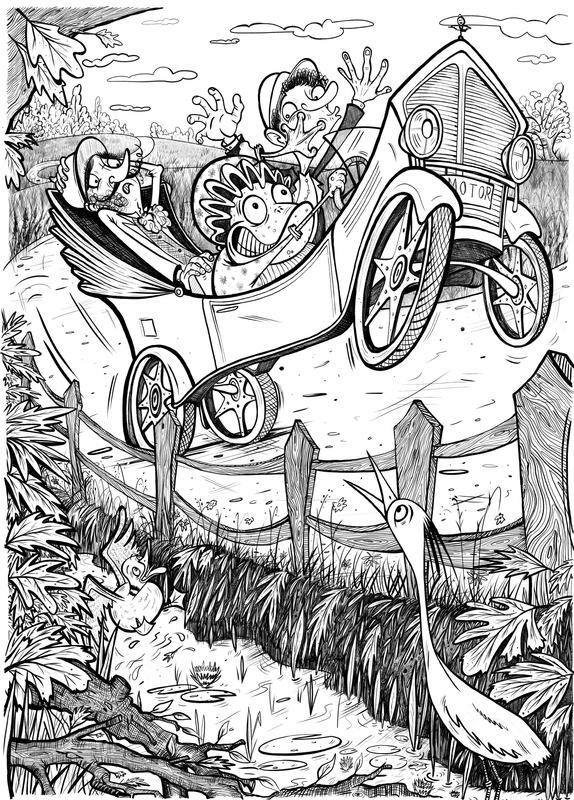 So obviously I entered and it just so happened that the brief was to illustrate a scene from Wind in the Willows. Pretty convenient considering I'd just completed the poster for The Sherman Theatre production of it. It had to be in black and white but that was fine as it was a great excuse to create something awesome on my new Huion tablet. I'm pretty pleased with the piece I've entered but I've no idea when the winners are announced. Pretty rubbish ending to this tale eh? I haven't even posted the illustration! The other competition I entered (I don't know the outcome of this either so don't hold your breath) was the massive Observer/Jonathan Cape/Comica Graphic Short Story Prize. I had to write and draw a four paged short story. With three weeks to go before the deadline I managed to churn out something which I'm really chuffed with. Dennis and June, pictured above, are a loving married couple commenting on life. Only, they live in the future and animals can talk and be business owners and marry inanimate objects if they want to. It's a bit different but hopefully good! I used the Huion tablet again for this one. It's quickly become my favourite way to illustrate. Winning the short story prize or even being shortlisted would be incredible! Although I'm well aware that the competition is fierce. Both Stephen Collins and Alexis Deacon have won it in the past and they have amazing careers. Imagine being as awesome as them! Funnily enough, Alexis is a judge on the Undiscovered Voices comp and Stephen is a judge on the Jonathan Cape one. I don't know what this means. Just that they're ace I guess. I've been thinking and thinking about how I can become a more successful illustrator. I figure I need to start small and work on the thing which might, in the end, be the thing that gets me the big commissions. That small thing is of course, my website! And in order for people to see my website and my work, I've been advised to blog! For my first blog post I thought I'd simply introduce myself. My name is Emily or Emilybob as my friends call me (silly story!) I grew up in the North East of England but at 18, moved to Middlesbrough to attend Cleveland College of Art. After a year of studying design, I moved to Wrexham and attended the gorgeous art college there, specialising in Illustration for Children's Publishing. I must admit, I was pretty lazy at uni and didn't work half as hard as I should have! But after many jobs doing this and that, I'm now attempting to make up for my wasted time and have a good go at becoming a professional Illustrator. Over the past few years my Illustration career has slowly started to grow. It started off with friends commissioning me to paint things like their pets which I'd post onto social media. 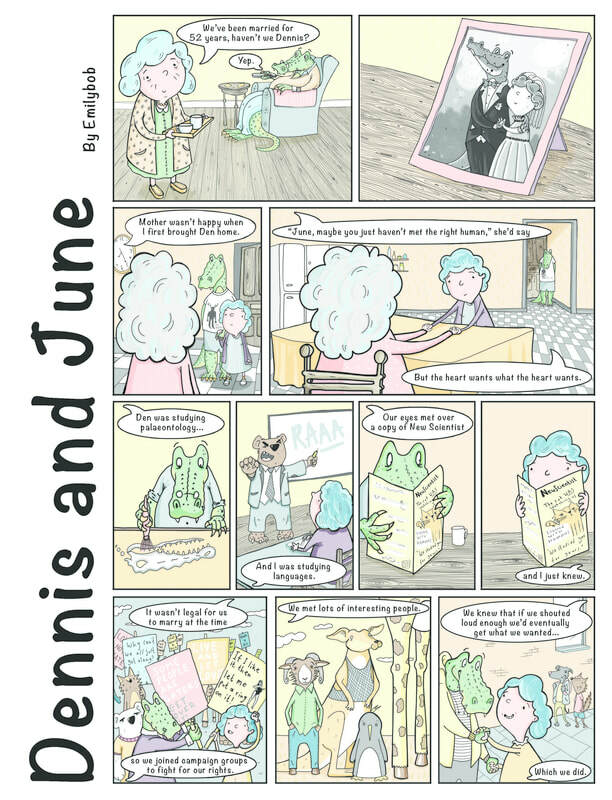 Strangers then began seeing my work and I'd be commissioned to do various jobs such as personalised comics. My biggest commission to date came when writer, Victoria Richards, asked me to illustrate the children's story she had writen. After three years, that project has only just come to an end but it was a brilliant piece to work on and it's been a real learning curve for us both. 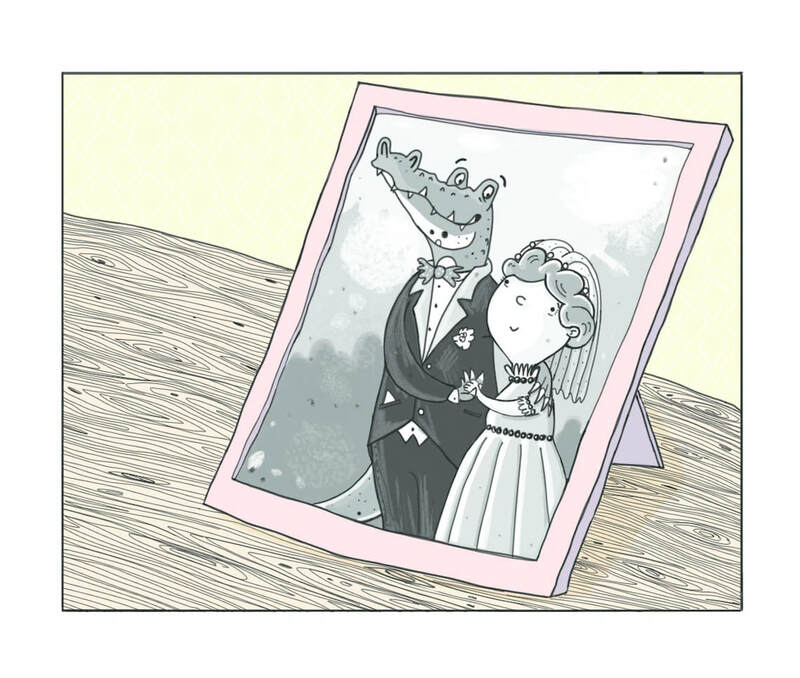 As a side project, Victoria and I also entered a picture book competition. The Stratford Literary Festival & Salariya Prize 2017. We were over the moon to be shortlisted and although we didn't win, the experience gave us lots of encouragement and proved to us that what we are creating is of quality. So with my portfolio growing and my style getting stronger (I think) I'm finding myself in a position of craving more illustration jobs. The problem is, how do I get them? ... Maybe that can be me second blog!